I have a 2011 Mustang GT Premium which I absolutely love, barring the stock Ford clutch, lol. I'm at the point mileage wise where if I trade it in now I break even on my loan and I've priced a new 2016 GT Premium with the GT performance package, 401a equipment, reverse sensing system, navigation, Enhanced Security, and yellow jacket ebony seats. Which model year do you all prefer? Still love my S197 over the S550. The s550 has grown on me, but I will keep mine. If you are after a GT350 then go for it, otherwise follow your heart. It's your money. 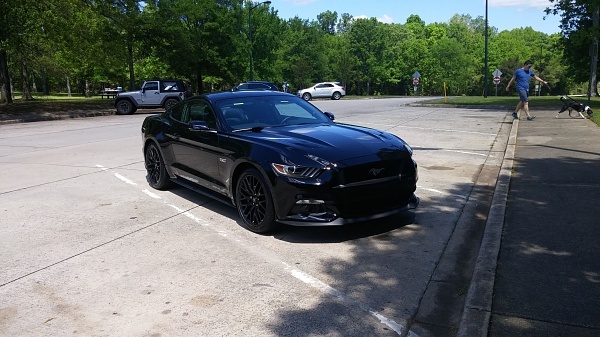 I got my new car this morning, 2016 Mustang GT Premium, Shadow Black, PP, 401a equipment package, reverse sensing, Enhanced Security, leather ebony interior. Considering the S550's are pretty ugly looking this is not even a close decision. That rear end is just hideous. Keep the 2011 all day long. And for the OP: nice car! I loved the 2011 and I also love this new 2016. They both have things on the body that are great anf things that are not so great. Bottomline is I love Ford's and Mustangs. Honestly though this new model there is no comparison as far as overall performance and ride quality to the previous models, it just is a level above. This. If you can stand the looks of the 16, sure. I personally will keep the S197, can't fix ugly. 2011 GT/CS Eibach Pro install on 2010 Bilsteins ? Matte Stripes or Gloss Stripes? Quick Reply: 2011 Mustang GT Premium or 2016 Mustang GT Premium?